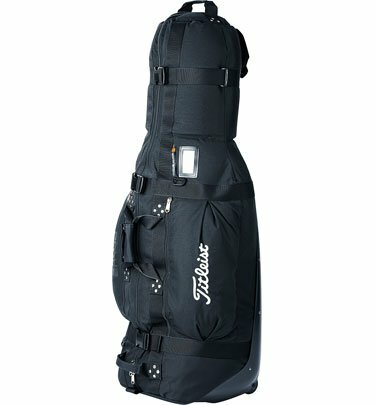 Titleist Club Glove Wheeled Travel Cover... Extreme Portable Convenience! Chosen by the worlds best players for golf club travel protection. Titleist Travel Cover by Club Glove feature: Patented Club Glove travel cover with Titleist embroidered script Large capacity central zippered compartment to fit golf bag (stand bag through 9.5A" cart) Two external gusseted, zippered shoe pockets One internal separate zippered, nylon shoe pocket Top 1/3 is foam padded to protect club heads from damage Three wide external web straps and buckles to secure items packed inside the cover Durable high-impact plastic bottom and 1/3 extension up the body of the cover Durable high-impact in-line skate wheels Handle at top of cover for ease when rolling bag Handle at bottom of cover to assist with transport Secure key locking system on external shoe pockets Secure small padlock locking system on large central zippered compartment Tour proven and market proven performance Dimensions: 47" x 17" x 12" Weight: 15 lbs Limited Lifetime Warranty Color: Black Titleist... For The Golfer Who Likes To Travel Easily!